Except for occasional ceremonial use in civil life, such as getting a college diploma, or the electronic metaphor of "scrolling" on a computer screen, we don't much use scrolls anymore—those rolls of paper with writing on them. In some religious use, however, they are still prominent. The Scroll of the Law in Judaism is one that contains the Torah or the Pentateuch; it is bound by elaborate rollers befitting the high ceremonial occasion for which it is used. Generally speaking, scrolls started to be replaced by books under the Romans in the first century AD; by around 300 AD, these two formats of "parchment media" were on a numerical par in Europe. The spread of Christianity was important in the gradual, but irresistible, replacement of scrolls by books in Europe well before the year 1000. Books are easier to read, store, and transport. Indeed, it is impossible to imagine a modern church service with scrolls. ("Please scroll through in your hymnals to 'Yes, We'll Gather by the River'—it should be about 12 feet into the scroll. I'll take ten and go get coffee while you look!") It is, thus, interesting that religious services of a certain kind were responsible for the comeback of the scroll around the year 1000—at least religious services of a certain kind and in certain places. These were the so-called Exultet Rolls in southern Italy. Exultet roll produced in the town of Troia. Note (from the indentations in the text) that the text is upside down in relation to the illustration. There then followed an extensive retelling not just of the life of Christ but of the world since Creation with appropriate illustrations on the scroll for various episodes, including Adam and Eve, the Flight from Egypt, the Crossing of the Red Sea, the Pillar of Fire, the Virgin and Child, the Crucifixion, Christ's descent into Hell, the Resurrected Christ, the Offering of the Candle, even the Praise of the Bees who provided wax to make the candle. Illustrations and text also praised the Church or the Pope, and the Emperor or King. In that regard, the scrolls underwent changes form the 10th to the 12th century that reflected social changes. There were two texts: Beneventan and Franco-Roman. Benevento was one of the great centers of Lombard culture in Italy; the Beneventan text is the older of the two and probably goes back to the eighth century. The later Franco-Roman text gradually replaced the earlier Beneventan one in the course of the 11th century as the authority of the Papacy grew in the south and Lombard power declined. As noted, the reading of the Exultet had a secular as well as religious function or, better, it fused the two by praising not just Church and Pope but also kings and emperors, past and present. 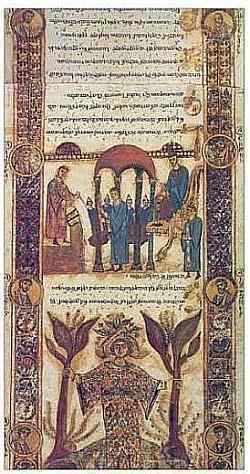 The scrolls (seen even in the single image above) have ornamental strips running on both sides of the text and illustrations. These strips contain a great number of miniature portraits. Scholars debate whether they were meant to represent real persons or whether they were "generic portraiture," that is, tributes to whoever happened to be king or emperor at the time and whose name would then be inserted between lines of nearby text to remind the deacon what name to praise. (Indeed, there are numerous palimpsest patches on the scrolls where such interlinear names have been scratched away and other names written over. The scholarly consensus seems to be that of Ladner: though some of the religious portraits, say, of a Pope, may be an attempt at an accurate rendering, the portraits of the kings and princes of the earth are generally "stereotyped communication-pictures without the intention of portrayal." The production of the Exultet scrolls started in Benevento and spread to other places throughout southern Italy, such as Bari, Gaeta, Capua, Troia and Salerno. There are extant fragments of scrolls in various museums and libraries in Italy, including the Vatican Library and the Diocese Museum of Salerno. These scrolls continue to be of great interest to students of medieval art, liturgy, and music. additional note on music: As a point of clarification, when we say that the scrolls contained text and music, the musical notation was in the form of "neumes," the forerunner of modern musical 5-line staff notation. Neumes generally did not indicate exact pitch but, rather, were markings above the text to remind the singer which direction the melody was to move and indicate something about the rhythm or how long to hold out a note. Neumes were a mnemonic device to help someone who already knew the melody. In the illustration above, the faint interlinear markings are the neumes. —Cavallo, Guglielmo. Exultet, rotoli liturgici del medioevo meridionale, IPZS, Rome, 1994. —di Frusca, Chiara. 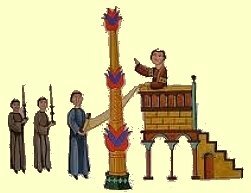 "Cultura libraria in una Società Multiculturale: l'Italia Meridionale nei secoli XI-XIII" in Le Mille e una Cultura, Scrittura e libri fra Oriente e Occidenta. Centro Universitario europeo per i beni culturali, Ravello, EDIPUGLIA. Bari, 2007. —Kelley, Thomas F. The Exultet in Southern Italy. Oxford University Press, New York, 1996. —Ladner, Gerard B. "The 'Portraits' of Emperors in Southern Italian Exultet Rolls and the Liturgical Commemoration of the Emperor" in Speculum, Vol. 17, No. 2 (Apr., 1942), pp. 181-200. Ladner cites extensively, and praises, an earlier work by Myrtilla Avery, Exultet Rolls of South Italy. Princeton University Press. Princeton, London, The Hague, 1936.